The Cave has been uniquely designed to deliver the ultimate therapeutic experience. Each treatment is designed to create a healing effect within the body and is therefore able to treat many conditions without the need for drugs. The Cave is tailored to anyone who aims to better their health through an all natural alternative therapy, or take a proactive approach in improving their health and quality of life. PLEASE NOTE: To purchase a sauna session gift card please click on the link above. There is no need to create a Mindbody account, simply click on the ONLINE STORE tab, select your desired gift card then click on LOG IN AS GUEST tab and process the payment. Don't hesitate to call 403.903.5821 if you require additional assistance. Kira Alston, RMT is an independent contractor for the Cave and handles her own appointment reservations and have her own massage gift certificates. To purchase a massage gift card please click on the following link: https://squareup.com/gift/D41ZE9CAMZJ18/order. Effective April 1, 2017, The Cave Sauna Day Spa will no longer be accepting SpaFinder Gift Certificates. The modern sauna design, beautiful aroma of cedar wood and the healing properties of citrus essential oil creates a comfortable and organic environment. The gentle sun like heat will deeply penetrate the skin and tissues and relax every part of your body and mind. Through a gentle sweating process the infrared sauna creates an atmosphere of comfort and increases blood flow. It is a great treatment for fibromyalgia, arthritis, muscle pain, joint pain, skin conditions, chronic ear infections, chronic stress and the detoxification for the optimal health. 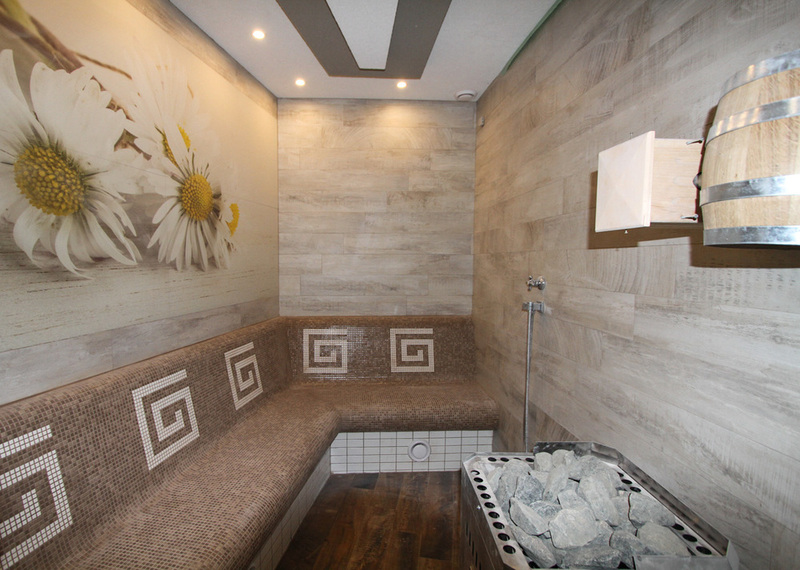 It is an ideal treatment for people who cannot tolerate high heat in a traditional dry sauna. Walk on pebbles while entering baths of hot and cold water where your feet and ankles are pleasantly massaged by small jets of water. It is a simple and effective form of hydrotherapy causing blood vessels to expand and contract. This therapy is beneficial for improving blood circulation. Changing water temperature stimulates the blood flow, reducing swelling and sensations of heaviness, and brings oxygenated blood in the lower limbs. It helps prevent varices and improves the metabolic system. Kneipp therapy is also used for people suffering from migraine headaches. This therapy goes back to the 19th century when the priest Sebastian Kneipp started studying naturopathic medicine and hydrotherapy to recover his health. He discovered that sudden and constant cold water stimuli boosted the immune and circulatory systems. Recommended for: high and low blood pressure, arthritis, rheumatism, varicose veins, leg cramps, cardiovascular diseases, migraines, digestive system problems and weak immune system. Rejuvenate your spirit; listen to relaxing music and breathe in the scent of eucalyptus essential oils in the pleasantly heated sauna room. Eucalyptus steam surrounds you and creates the perfect healing space for your cardiovascular and respiratory body systems. It is effective in treating stress and mental disorders. It relaxes muscles and helps eliminate lactic acid build up. It also eases muscle tension and pain and promotes better sleep and deep relaxation. It aids in the decrease of asthmatic conditions, and removes mucus and toxins from the lungs. Rub your heated body with the cold ice flakes and enjoy a wonderful tingling sensation on your skin. This unique refreshing experience stimulates blood circulation, strengthens your immune system, improves the appearance of cellulite and tightens the skin. Brave enough to dip into the cold water tub? Cold water immersion is a great and supportive therapy for sport injury recovery and fatigue. It helps flush harmful metabolic debris out of your muscles, suppress swelling and inflammation, and normalize adrenaline production so the body can recover faster than normal. Guests can have the cooling tub filled for an additional charge of $25. Several functions let you to choose between a gentle Rain Shower or the Shower Jet Massage to cool down between the sauna treatments. An ideal cooling off procedure for our brave customers. The bucket filled with cold water is instantly dumped on body to improve blood circulation, and cool down the body between sauna treatments. Soothing sound of a water fountain, tepid air induced with the black grape essential oil and mood light; all to create a peaceful sensation of harmony and relaxation. Enter and enjoy a pleasant heat on your body radiating from the water heated loungers shaped for the perfect spa experience. Step into an oasis of peace, rest and harmony. Organic room design, leather loungers, fireplace and soothing music create a relaxing atmosphere where you can let the body and mind rest after your sauna treatments. Feel the sensations through the body as it regulates itself back to normal. Steam, essential oils and salt is combined to create the sea atmosphere of this unique inhalation room. Relax and take time to inhale the therapeutic steam, refresh your skin and leave your sinuses feeling clear and cleansed. For centuries, people have trusted the benefits of salt therapy (speleotherapy with Himalayan salt) to relieve respiratory illnesses, improve skin conditions and strengthen their immune systems. In addition to helping with respiratory illnesses, salt therapy can help many common skin diseases including: eczema, psoriasis, and acne. Salt therapy also promotes stress reduction through the production of negative ions to boost the immune system and reduce chronic stress and fatigue. 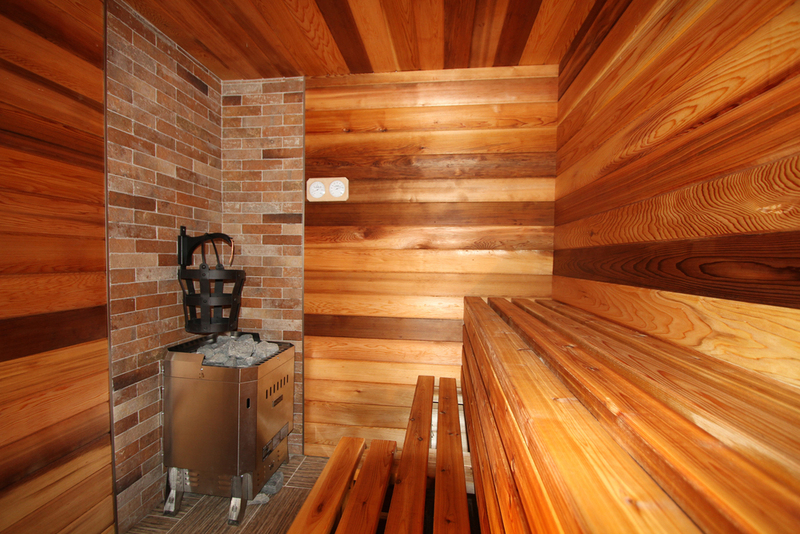 Dry sauna exposes the body to high temperature. Intensive body heating melts away stress and strain of tired and stiff muscles. Heat relieves pain by expanding blood vessels and increasing circulation. Better circulation allows more oxygen to reach injured areas of the body and helps reduce pain and speed up the healing process. It is also a great for injury prevention. Built out of red cedar, the Finnish sauna has two levels of benches that vary in temperature, with the higher level being hotter. A high-efficiency wood stove heats over a tonne of stones, which radiates dry heat combined with the essential oils. Close your eyes and let your body temperature raise creating a sensation of deep relaxation and rest. Your blood will circulate in your veins like hot fire and stimulate the immune system. As heat from the blood begins to move toward the skin's surface, the body’s nervous system sends signals to millions of sweat glands that cover the human body. As the sweat glands become stimulated, they produce sweat. Deep sweating in a sauna can help reduce levels of lead, copper, zinc, nickel, mercury - toxins that are commonly absorbed by simply interacting with our daily environments. Sweat therapy is one of the best methods of body detoxification. It eliminates harmful toxins through the largest human organ – the skin. Heat Therapy stimulates the sweat glands allowing body to detoxify while strengthening the body’s immune system. This helps fight off everything from the common cold to serious and life threatening diseases such as cancer. 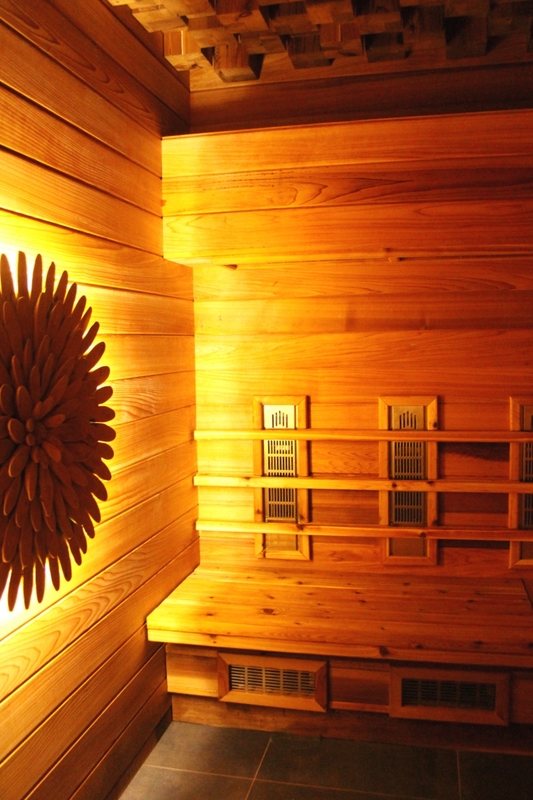 Sauna treatment stimulates the body’s own natural healing process and promotes a sense of well-being. Alternative inhalation of herb vapors is a typical element of this therapy treatment. The room is infused with chamomile, rosemary and thyme, 100% natural herbs, to purify and cleanse body organs and help to reduce stress and relax the mind and body.